Hurricane Irene was one of the costliest hurricanes on record in the Northeastern United States. Irene originated from a well-defined Atlantic tropical wave that began showing signs of organization east of the Lesser Antilles. Due to development of atmospheric convection and a closed center of circulation, the system was designated as Tropical Storm Irene on August 20, 2011. After intensifying, Irene made landfall in St. Croix as a strong tropical storm later that day. Early on August 21, the storm made a second landfall in Puerto Rico. 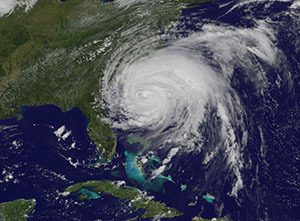 While crossing the island, Irene strengthened into a Category 1 hurricane. The storm paralleled offshore of Hispaniola, continued to slowly intensify in the process. Shortly before makingfour landfalls in the Bahamas, Irene peaked as a 120 mph (195 km/h) Category 3 hurricane. Throughout its path, Irene caused widespread destruction and at least 56 deaths; monetary losses in the Caribbean were estimated to be as high as US$3.1 billion. Damage estimates throughout the United States are estimated near $7 billion, which remains an uncertain estimate.